These flower drawings in pencil are all done as a basic outline to make it easy for you to copy and draw along with me. 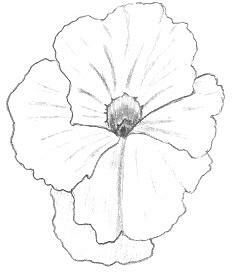 To kick off our drawing time together, let's try this outline of a pansy. If you can get the outline right, all the rest of the drawing will just fall into place. There are so many varieties of pansies and they are so pretty - it's like they were made just for us to do some lovely illustrations. These particular flowers are ideal for decorating birthday cards and they are especially great in color. However, before we start dabbling with color, we need to be sure we can imitate the outline or form adequately. The trick is to start with simple drawings and then gradually move onto more complex subjects. I like to think I specialize in simple because it is the only way to prove and convince myself I can draw! These pencil flower drawings do portray beauty in its simplest form. I know we are all different (and that's a good thing), but I just love the look of black and white flower drawings. Once you feel you can draw the pansy successfully, keep going and copy the different varieties shown here. If you want a little more guidance to get underway, this helpful marking system might be the answer. Fill up your sketchbook with these delightful flower drawings in pencil and you will have hours of pleasure as you browse through them at a later date. That's one of my favorite activities! For my next drawing, I decided to do a poinsettia or, should I say, my version of a poinsettia. This is not an easy drawing when you are copying from a reference picture because there are no clear lines to follow. The foliage is all huddled together and can appear complicated to raw beginner artists. If you find this is the case for you, leave this one until you feel ready. Poinsettias have a bright red flower with a yellow cluster in the center. There are other colors available now in cream, pink and white - it's very clever how new plants are created these days. I used to have a beautiful red poinsettia in my garden and it provided me with much pleasurable viewing. This is a drawing of a common violet. This drawing consists of very simple lines with some stippling for effect. It is important to observe the little bits that make a flower attractive. It is up to you how much you highlight in a drawing, the main idea is to illustrate how you perceive nature. It is your opportunity to think with a pencil. The shapes and color of the violet are an eye-catching combination in the garden but I think my flower drawing in pencil still shows off its charm. A daffodil is one flower that is very popular so you might receive a lot of requests to draw this for your friends. Consistent practice and study will help you to achieve successful drawings. I love daffodils despite the fact that yellow is not one of my most favorite colors. My daffodil illustration doesn't really do this bloom much justice, this is one rare occasion when I do miss its vibrant yellow-gold color. I need to keep practicing this one. Flower drawings in pencil are even more spectacular when the flower is originally white, just like magnolias. A magnolia is commonly white and the type that grows in Australia has a lovely purple tinge. I do a lot of magnolia drawings because I think the flower has a type of regal look and feel. 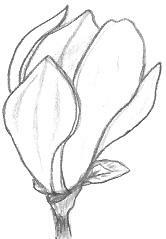 This drawing is one of my first magnolia drawings. I tried to express the silkiness of the petal by gently brushing the side of my pencil in places where I could see a faint purple shadow. I grow lots of different varieties of fuchsias in my garden at home. I love the way they flower all year round. We've been in drought conditions for several years and my outdoor plants have been neglected due to water restrictions. However, my fuchsias continue to thrive despite not getting much water. They are very pretty and they always lift my spirits when I see them. Observation is a crucial part of becoming an artist, you really rely on what you are seeing before you and converting that into your own flower drawings in pencil. There is no need to feel panic when someone asks you to draw something for them. It is by studying other artwork that you get the idea on how to portray different subjects and it all comes naturally after you spend quality time with your pencil. Try doing a lot of simple drawing exercises, something like a step by step tutorial on how to sketch a rose. I made a lot of notes to myself when I was researching the drawings to be shown here. I ended up with a huge list of my favorite flowers that I wanted to draw. It's obvious that I'm going to have to add a lot more pages of flower drawings in pencil! All of these drawings were done with a 2B retractable/mechanical pencil. I like it the best because it stays relatively sharp all the time. I was doing lots of rough sketches of flower drawings in pencil on almost every spare piece of paper that I found and it is such fun to view them as I go through my notes. And by the way, if you are looking for the best learn to draw instruction book, check out the ABC of Art Skills. there's so much more, you have to try it and see for yourself. Once you read this book, you begin to train yourself and you can watch your creative talent come alive. It begins with something simple and becomes an exciting journey of discovery. 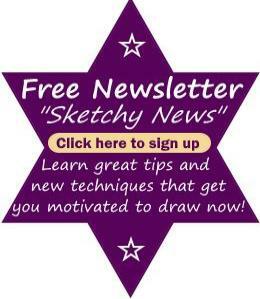 If you're serious about learning to draw, this is one resource you should have right now. It's one of the first books I bought and Jenni is a very good teacher. Make sure you get yourself a copy of ABC of Art Skills. It's guaranteed you'll like it or your money is refunded, no questions asked.